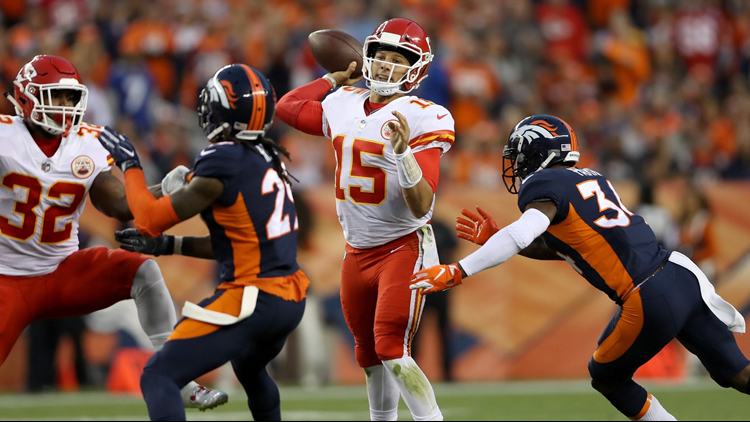 Quarterback Patrick Mahomes #15 of the Kansas City Chiefs throws against the Denver Broncos at Broncos Stadium at Mile High on October 1, 2018 in Denver, Colorado. Will the Broncos pull off an upset? ENGLEWOOD – Here the season is nearly half finished, and Vance Joseph has shown he knows how to slow the Kansas City Chiefs’ offense better than anybody. The Broncos are the only team that has held the Chiefs to less than 30 points – albeit in a 27-23 loss three weeks ago. And the Chiefs had just 13 points through three quarters. If the Denver D can contain Patrick Mahomes from breaking the right side of the pocket – as he did too many times in the fourth quarter back on October 1 -- it might have a chance to pull off an upset Sunday against Kansas City at Arrowhead Stadium. (The Chiefs are 9-point favorites). If the Chiefs’ offense gets rolling like usual, though, it will be a long afternoon for the Broncos. The Chiefs in their other six games have scored 38, 42, 38, 30, 40 and 45 points. Or 38.8 PPNBG – points per non-Broncos game. What has made the 6-1 Chiefs mostly unstoppable this season? Mahomes? His numerous weapons? Head coach Andy Reid’s scheme? And then Joseph did a terrific job of explaining Football 101 for Dummies while addressing Reid’s creative play calling. “If you see them in two-back, it looks like NFL football,’’ Joseph said. “If you see them with two tight ends, it looks like NFL football. But, once he goes to three wide receivers, one back and one tight, it looks like college football. The only two players the Broncos would seriously entertain trading are receiver Demaryius Thomas and inside linebacker Brandon Marshall because they have young players behind them ready for more playing time in Courtland Sutton and Josey Jewell, respectively. But other players have been mentioned. NFL.com has floated cornerback Bradley Roby’s name around although by letting him play out the season and then becoming a free agent, the Broncos could pick up a nice compensatory pick if he signs a big contract elsewhere. Roby has bounced back nicely to play well in the two games since his rough game against the New York Jets. Pass-rushing outside linebacker Shane Ray is in a similar situation as Roby in that he’s a free agent after this season. Ray missed the game last Thursday at Arizona because of a left high ankle sprain and will be iffy for the game Sunday against his hometown Chiefs in Kansas City. Ray said he thought he would be able to practice later in the week and be well enough to play Sunday. Although starting safety Darian Stewart, backup receiver/returner DaeSean Hamilton and running back Royce Freeman are considered day-to-day with their injuries, it would not be a surprised if they missed a game or two. Stewart has been having nerve issues in his neck. He had his third stinger in three weeks Thursday and his latest knocked him out from the middle of the first quarter. Hamilton suffered a second-degree MCL strain after he was run into by a tackler despite calling for a fair catch. Freeman suffered a high ankle sprain. Su’a Cravens is eligible to leave the injured reserve list and play next Sunday against the Houston Texans at Broncos Stadium at Mile High. Cravens appears to have adequately recovered from his knee surgery and is expected to be cleared to play next week. Cravens missed all of last season with Washington because of various injuries, so the game against the Texans would be his first in 23 months. The Broncos had the ultimate gift while outrecruiting the New York Jets for rookie center Nico Falah: A 53-man roster spot. When the Broncos went about signing Falah off the Jets’ practice squad, the Jets tried to keep him by upping his salary to the active roster minimum of $480,000. But after Falah was undrafted out of USC and cut by the Tennessee Titans following their final preseason game, he coveted his first 53-man roster spot.